An Africanized honeybee, also known as a killer bee. 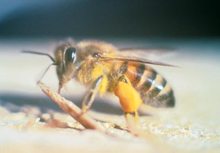 Africanized honeybees are indeed more aggressive than European honeybees, but their stings are not any more deadly. When they do engage animals that they have determined are predators, they are more successful than their European counterparts, not because of the power of their stings, but because they attack in far greater numbers, with far less provocation, and with far greater persistence. For these reasons, they are far more likely than their European counterparts to get "inside" their targets' OODA loops. This is the same strategy that the attacker in the office exploits when employing rapid-fire attacks. Photo (cc) Jeffrey W. Lotz, courtesy Wikipedia. The rapid-fire attack, often executed before witnesses or within earshot of witnesses, can be unbearable. Defending against it can be even more difficult. But targets who understand the dynamics that make these attacks so hurtful can respond effectively. And that can be very satisfying. The OODA model of conflict can help us understand the power of the rapid-fire attack. (See "OODA at Work," Point Lookout for April 6, 2011) According to OODA, when we're engaged in conflict, we cycle through a loop of Observing, Orienting, Deciding, and Acting. If the attacks arrive more rapidly than the target can cycle through his or her OODA loop, the attacker can eventually prevail. Unable to keep up with the attacks, some targets feel so overloaded and frustrated that clear thinking itself becomes impossible. When this happens, how can targets respond? Let's first explore some responses that are usually ineffective. Targets can complain to the attacker's supervisor, to their own supervisors, or to the Human Resources department. Most likely, if a pattern is in place, a competent supervisor — the target's or the attacker's — would have already noticed the pattern. The supervisor hasn't acted effectively, and probably won't or can't. Still, complaining to supervisors might be worthwhile. It's a matter of judgment. Filing complaints with Human Resources might work, especially if the organization has a workplace bullying policy. (See "What Is Workplace Bullying?," Point Lookout for March 3, 2010, for more) But what ensues will be beyond the target's control. For example, the investigation will probably involve interviews of all concerned. If any of those interviewed experience these interviews as attacks instigated by the target, retribution could follow. Sometimes, targets try to assemble alliances of witnesses and other targets, before filing a joint complaint. This approach can work, but there are risks. First, alliance members might not preserve confidentiality. If any of them circulates information about the alliance before the alliance takes action, the attacker can disable the alliance before it can act. More important, the person who initiates the alliance might be seen by Management as a "troublemaker." Almost certainly, the attacker will attempt to characterize the alliance initiator as such. If that characterization sticks, the initiator has a new problem, far more serious than the attacker's attacks. bullying policybut targets must maintain an unfailingly cool demeanor, because the attacks will persist, and they might even escalate. As they escalate, they become more obvious to all, and the attacker acquires a well-deserved reputation. If the target remains cool, never showing aggression, the attacks will seem to be unprovoked, which could force Management to act. But a single break in discipline by the target can make the attacks seem provoked, reducing the likelihood of Management intervening on behalf of the target. Would you like to see your comments posted here? rbrenfpnMwwFnRtqKXLmMner@ChacwEvZeUaydFMxYlkroCanyon.comSend me your comments by email, or by Web form. I offer email and telephone coaching at both corporate and individual rates. Contact Rick for details at rbrenyVNnAhQBwBockPPdner@ChacFYCmkAtSQDuyHZivoCanyon.com or (650) 787-6475, or toll-free in the continental US at (866) 378-5470.